When Koreans raised this rising sun flag issue? In 2011 Asian Cup semi-final of Japan vs. ROK, Ki Sung-yueng of ROK made a goal by PK and imitated a monkey, which is an action to insult Japan in Korea. And this ridiculous much ado started. Koreans had not complain about the rising sun flag so much before that, even in Seoul Olympics. The percentage of welfare recipients is the problem. It is already a burden for each local community. You are taking the situation too lightly. The percentage of recipients among Korean residents is 14.2% and higher than other foreigners groups without doubt. The percentage of Chinese residents is only 1.6%. And it is true there are lots of illegal Korean recipients. Also, The Japanese Supreme Court which states that permanent foreign residents have no legal right to social security payments, although they can be awarded these payments based on the discretion of local authorities. Oh, you have the point by the way. Japanese embassy in Korea should be presented with the police 365 days / 24 hours, and they should avoid the demo or any other harassment in front of the embassy, and remove that ugly statue from the public road (Vienna Convention on Diplomatic Relations + Public road act in Korea, if they have). I don't understand Why Korean government do not do this appropriately. I heard these are the comments posted in the section of Japanese Welfare Public Assistance issue, as there are lots of illegal recipients including foreigners these days, especially Korean people. For instance, a Korean family received 11 million yen per year illegally, while applications of Japanese for the welfare assistance are getting more and more difficult to be accepted, and the comments seem to be the one criticizing the government policy about that. It is not fair not to give this information first and pick up only harsh words written at the end of a rather long comment. In any other countries can foreigners receive welfare money easier than their own nationals? This is what is called a documentary. I don't think "The Cove" is, because they used red color as an effect, mixing the whaling scenes at the Faroe Islands into the film, and so on. This is a cheating as a documentary. Not only the movie "The Cove", I recommend to watch "Behind the Cove" and "Okujirasama" to see the situation more neutrally. Oh, by the way, South Korea is hunting more whales than Japan by "accident". South Korea hunted 1849 whales in 2014, 1997 in 2013, 2751 in 2012 by "accident", by Korean Research Institute. But they only reported to IWC the number of 58 in 2013. Japan hunted 116 by "accident" (if the whales are alive, they are released and only dead ones are taken - by Japanese fishermen, and 475 as the research whaling in 2013. Sea Shepherd has established their Korean Branch this year. Are they going to criticize ROK or just continue criticizing Japan from ROK? "The main treaty was opened for signature on December 1, 1959, and officially entered into force on June 23, 1961. The original signatories were the 12 countries active in Antarctica during the International Geophysical Year (IGY) of 1957–58. The twelve countries that had significant interests in Antarctica at the time were: Argentina, Australia, Belgium, Chile, France, Japan, New Zealand, Norway, South Africa, the Soviet Union, the United Kingdom and the United States. These countries had established over 50 Antarctic stations for the IGY. The treaty was a diplomatic expression of the operational and scientific cooperation that had been achieved "on the ice". I want to refer to a comment in the Reddit Australia, which explains the situation of Japanese whaling, and I agreed the most. "The Japanese whaling situation is actually a pretty nuanced story. The only reason Japan signed on to the International Whaling Commission's ban is because the US threatened to revoke Japan's fishing rights in the Bering Sea if they didn't sign. A few years later, US revoked that fishing right anyway. At that point Japan indicated that they intend to back out of the IWC agreement and resume whaling operations. IWC freaked out and told Japan that they'll create a 'scientific whaling' exemption that'll allow Japan to resume whaling but also maintain membership on IWC. Japan agreed and have been adhering to those rules. Unfortunately there's been a sharp increase in anti-whaling sentiment and now people are roasting Japan for their totally fake 'scientific whaling' program that the IWC convinced them to create in the first place. US basically bullied them into signing IWC and then failed to hold up their part of the bargain. And then IWC begged Japan to stay as long as they called their whaling 'scientific'. Now they're copping sh.t for the obvious farce that the 'scientific whaling' is, even though they never wanted to do anything like that. Bonus points: All the talk of whaling in 'Australian waters' is bullsh.t. The whaling operations take place in waters that fall under joint ownership of Australia and Japan as part of the Antarctic Treaty. Australia just claims those waters as their own when the topic of whaling comes up. Those claims are legally baseless which is precisely why they can't and won't actually stop Japan from continuing operations. tl:dr; Japan got screwed by the US and IWC. They have every right to be angry and to continue whaling within the law (they do). Meanwhile Norway's whaling operations eclipse those of Japan but no one cares about that. Learning the history of Japanese whaling was one of those moments when I realized that what we treat as undisputed fact here in Australia is basically just propaganda that completely covers up the history that created the situation as it is today. The funny thing is every time you see politicians discussing this on TV and saying 'australian waters' and claiming we can take some kind of action, those politicians know all of the above and that AU has absolutely no standing. They just repeat these bullsh.t talking points because they appeal to potential voters." The Mayor of Osaka tried to have a talk with the Mayor of San Francisco several times, es, but it was rejected. This is not fair at all. A comfort woman died at the age of 93 on 11 November, 2017. The Korean anti-Japan group says she was deceived and dragged to a comfort station in Singapore and forced to be a comfort woman there at the age of 15. It is calculated that she was 15 in 1939 when Singapore was under British occupation. Hilarious. She should have asked the compensation to U.K. 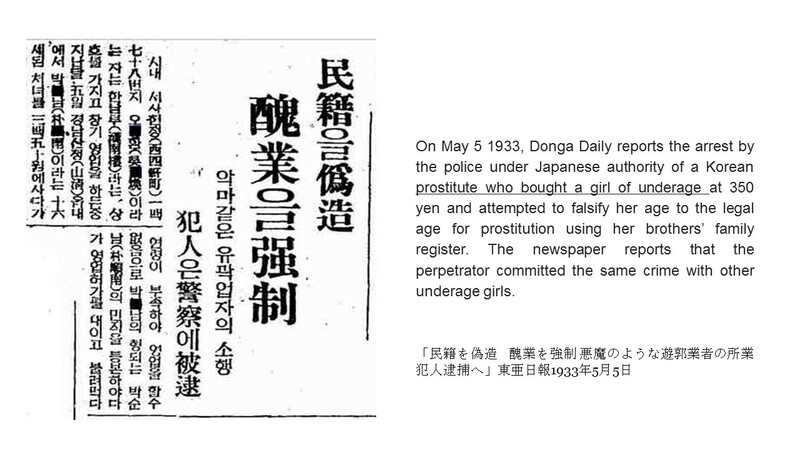 This is not the only one contradiction in the testimonies of so-called Korean comfort women. Japanese people are now totally doubtful about their testimonies, and there are only such testimonies that Korea has presented as the evidence of the coercion by Japanese Military. Yes, you are right. Not only Prof. Park Yu-ha, they blamed Prof. Lee Young-hoon of Seoul University and resorted to violence, for his argument that the number of comfort women and forced laborers is exaggerated in Korea's textbooks and challenges the Korean's common beliefs: "Japanese colonial rule and development has been considered an absolute evil." As I commented above, their belief is already a cult. Of course this is a critical timing. What situation do you think SK is in at the moment ? They have so many issues to talk with both the US and Japan before thinking of how to harass Japan. And never forget that there are tremendous number of South Koreans who were kidnapped by North Korea, about 3,800 people have been abducted (the vast majority in the late 1970s), 480 of whom are still being held. Why are they pretending to forget about this? And why are they blaming Japan for appealing their abduction victims? SK is wasting valuable diplomatic opportunities just for harassing Japan. Ridiculous. Their anti-Japan something is already a cult. After long arguments above, there is no clear and firm evidence provided to back the credibility of Korean comfort women's testimonies after all. On the contrary, there are so many to give doubt about their credibility. That's all. Japanese will never be deceived. Taiwanese were never deceived by the education imposed by Gaishojin from China. They tell the truth whether bad or good. That's why Japanese respect them unlike Koreans. That's the fact. No more. No, I didn't say that. Some of the women have said that's what happened. Trafficking and kidnapping are not synonymous. Does it mean you are saying JIM was responsible for trafficking? And, are you aware that you have gone back to resorting to oral testimonies without giving a firm evidence? Sources please. You are saying you do not accept the evidences provided. But you never provide us enough clear evidences to support your statement so far. If you want to see more, you can refer to the Nadeshiko Action Page above. 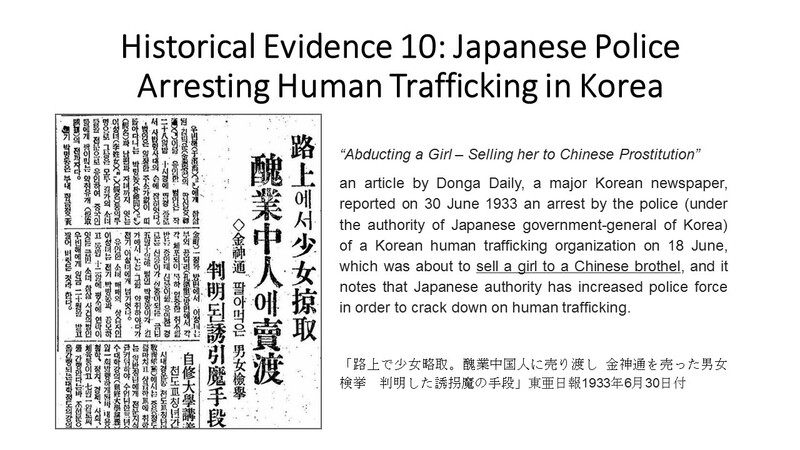 Prostituton business was not illegal at that time, but kidnapping, human trafficking, forceful recruitment were of course crimes to be arrested, charged and punished in Korea under Japanese control. And "Ex post facto laws retroactively change the rules of evidence in a criminal case, retroactively alter the definition of a crime, retroactively increase the punishment for a criminal act, or punish conduct that was legal when committed. They are prohibited by Article I, Section 10, Clause 1, of the U.S. Constitution. An ex post facto law is considered a hallmark of tyranny because it deprives people of a sense of what behavior will or will not be punished and allows for random punishment at the whim of those in power." In this case, it is 'prostitution', I suppose. I reiterate that there is no evidence that Japan was responsible for such crimes stated above in the first place. It seems that China is taking anti-Japan activities by political reasons. This is the point why Japanese people think we can deal with it because there is a reason that we can see. As for SK, anti-Japan is already a cult. They just move emotionally. They ignore reasons, even their own national interest when it comes to anti-Japan things. Japanese people do not like or cannot accept such irrationality. That's why the majority of Japanese have given up about SK. Many say "Leave them." @Yoshitsune, this may explain what I said above. 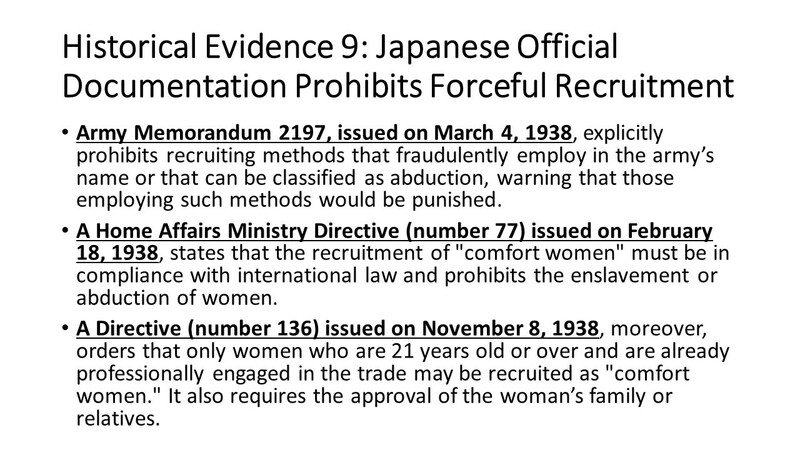 Japanese people had sympathy for the comfort women at the first because they had actually worked for Japan in the wartime, and wanted to help them by moral reasons, although we can no longer handle it legally. That's why Asian Women's Fund was established. And you know what happened to it. And lies after lies, and such ugly statues after statues to disgrace Japan. Our sympathy has dried up already. Yoshitsune The problem is the buying and selling of human beings. The legality of prostitution does not mean it was okay to buy women for the purpose of using them as prostitutes. Are you going to support retrospective law thing!? That's a surprise. I know there is a ridiculously typical retrospective law called "Special law to redeem pro-Japanese collaborators" in Korea. But rapes and killing were crimes and are still crimes, which were caused by Korean soldiers in Vietnam. I have just read the following two. Very informative. tinawatanabeOct. 29, 2015 - 07:01PM JST Stranger, I predicted about two years ago that Japan's trad/investment/tourists to SK would shrink and I was right. And I predict the trend WILL continue as long as Koreans continue Japan bashing using SK version of "history". You keep saying about money, but the money is not most important thing. Nothing hurts more than false charge. If you hate Japan so much you should cut diplomatic relation. I quite understand what you mean. I think I commented the similar thing before, like "Korea will see why Japanese are called 'silent claimers' soon. Japanese people never go violent like Chinese do, but once determined, they would never come back." Now 70-80 percent Japanes say Japan does not need the connections with South Korea in their business. The reason why PM Abe and his government are confident in dealing with this issue is that they know Japanese silent majority is backing the way they are doing now against Korea. The majority of Japanese are now well aware that Korea is far from trustworthy, and there is not much truth in the testimonies of so-called Korean comfort women. Tina, 'tired of' is a rather gentle wording. I'm really fed up with their lies. Three principles of No-Korea; Not teaching, not helping, and not being involved." @cleo, your comment does not make sense, because the FOR was 30%, and AGAINST was 60% in the beginning with almost the same male/female ratio. It is more natural to think that people with more information over the course of time tend to cast a vote FOR the bill. I want to see other polls later anyway. In the Yahoo Japan Poll, the percentage FOR the bill reached 50%, while AGAINST the bill is 47.2% as of today. Some days ago, the AGAINST was the majority. Seems to me very rational. This is a different trend from what is said by the mass media though. I'm glad everyone knows that the protesters are not Japanese or Japanese descendents. I think this is a good video describing what Japanese think about foreigners wearing Kimono. Sorry, I made a typical Japanese mistake. Please read pleasure instead of presure. I'm not a specialist, but this kimono seems to have too gorgeous or showy patterns, not like Japanese traditional patterns. I first saw the painting when I was a school kid, and thought it might be a souvenior kimono for foreigners, or made for exports. There was a similar case for chinaware made in Japan. There were high-class courtesan called "Oiran" in Japan before Meiji period, and the girls wore very gorgeous kimonos. This might be one of them, and someone might have brought back to France. Then, it should be described accordingly. Nevertheless, it is not insulting at all. Because it is the history. If there is any misunderstanding or incorrectness, it would be presure for Japanese specialists to provide the information. That's all. Japanese would never call this event at the museum "racism", as we have a pride in our culture and are very grateful if people of other countries take interest in it. There might be some mistakes or preconceived ideas, but still, having an interest in something is the first step to understand it. If those people, although I don't know whether they are really Asians, have a pride in Oriental culture, they should not do this kind of thing. Because it is to block the understanding of others and even escalate the biases. Wartime requisition labour is exempted from the forced labour in the international law. The Japanese ambassador said "forced to work", not forced labour, and it was the same for Japanese during the war, and of course, S. Koreans were Japanese at that time. As I said before, they were exempted from such labour first. Also, as Ma Go stated above, actually South Koreans who worked at these industrial sites recently received a refund of welfare pension, although it was 199 yen according to the relevant calculation. It proves they were under pension program. I'm sure you would admit that there is no slave who is in such welfare program. After all, Koreans claims are full of contradictions. What Japan says is that it was the wartime requisition labour (like conscription). It was mandatory for Japanese from the early stage, and Koreans were exempted from such labour until shortly before the end of the war. It can be said that Japanese were forced to work at factories, against their will in a meaning. This occured in even European nations during the wartime. Other Koreans were migrant workers from the beginning. They came to Japan because the work might have been with high risk but well paid. There were also Taiwanese workers, but I read an article where they are talking about the work at that time with nostalgia.